George Cassinello and Nicola Cassinello were two brothers who worked as photographers in Sussex during the 19th century. 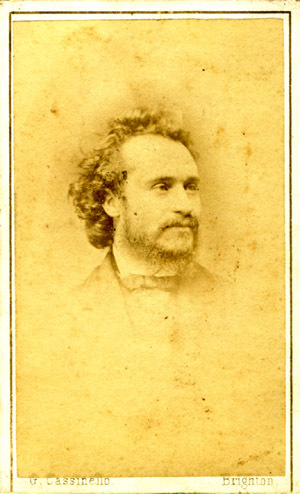 George Cassinello operated photographic studios in Brighton between 1861 and 1880. 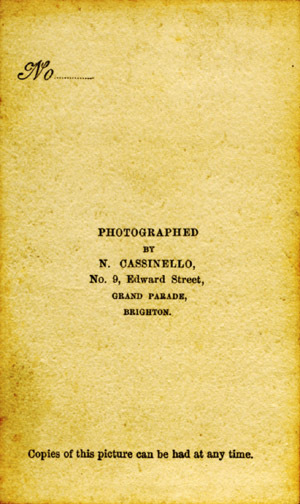 Nicola Cassinello also worked as a photographer in Brighton around 1865 and when the 1871 census was taken Nicola and a brother named Pope Cassinello were recorded as photographers in Hastings. In the 1840s, Domenico Cassinello and his family were living in London. When the 1851 census was taken, Domenico Cassinello, his wife Mary Ann and their children were living at 3 Saffron Court, Holborn. Domenico Cassinello is described on the census return as a "Lodging House Keeper", aged 58. George Cassinello is described as an "Artist", aged 20. Nicola Cassinello, George's younger brother, is entered on the census return as an eighteen year old "Picture Frame Maker". Also recorded in the Cassinello household at the time of the 1851 census were fifteen year old Catherine Cassinello (born c1836, Italy), a child named Mary Ann Cassinello (born c1845, Birmingham) and John Cassinello (born c1811, London), probably Dominico's brother or cousin, is described on the census return as a "Cabinet Maker", aged 40. Sarah Ann Cassinello (born c1830), possibly Dominico Cassinello's eldest daughter, had married Antonio Scarpenti in London in 1847. * Domenico Cassinello's itinerant lifestyle and possibly poor grasp of the English language resulted in confusion about his children's place of birth. George Cassinello's birthplace is given variously as Dublin, Geneva and Genoa. Nicola Cassinello was probably equally unclear about his origins. On the 1851 census return, Domenico states that Nicola was born in Italy, yet Nicola Cassinello himself maintained that he was born in Hull, Yorkshire. On the 1851 census return, Domenico Cassinello indicates that Nicola was born in Italy around 1833 and his daughter Catherine was born in Italy around 1836, which suggests the family might have returned to Cassinello's country of origin around the time of George Cassinello's birth around 1831. * Since creating this webpage in October 2007, I have been contacted by Robert Hanson, a fellow researcher into the complex Cassinello family history, who has kindly provided documentary evidence which provides more accurate data regarding dates, names and locations. Where dates and names have been corrected or amended on the basis of Robert Hanson's research I have provided a reference with a RH prefix to acknowledge Mr Hanson's contribution to the Cassinello story. [ABOVE] The trade plate of George Cassinello , photographer of Brighton. [ABOVE] An outdoor portrait of an unknown family group photographed by George Cassinello of 60 Middle Street, Brighton (c1866). The origins of George Cassinello and other family members are obscure. George Cassinello was either born in Dublin or Genoa, Italy. The birthplace of his brother Nicola Cassinello is given as either Italy or Kingston-upon-Hull in the East Riding of Yorkshire. [ABOVE] A vignette portrait of a bearded man, photographed by George Cassinello, Miniature Painter & Portrait and Landscape Photographer of 60 Middle Street, Brighton (c1870). George Cassinello was born around 1831. His father Domenico Cassinello was an Italian from Genoa, but George was probably born in Dublin, Ireland, the home of his mother Mary Ann Cassinello (born c1795, Dublin). According to a letter published in the British Journal of Photography in 1902, George Cassinello was, at the age of 18, apprenticed to the famous photographic artist John Jabez Edwin Mayall (1813-1901), who had recently opened a daguerreotype studio in London's Strand. Born near Oldham, Lancashire, John J. E. Mayall had worked as a daguerreotype artist in the American city of Philadelphia during the early 1840s. Mayall had returned to England in 1846 and established Mayall's American Daguerreotype Institution at 433 Strand, London in May 1847. George Cassinello joined Mayall's Daguerreotype Institution in 1848 and reportedly assisted John J. E. Mayall when he made daguerreotype views of the interior of the Crystal Palace at the time of the Great Exhibition of 1851. When the census was carried out in London at the end of March 1851, George Cassinello was recorded as a twenty year old "Artist" and living with his parents in Holborn, London. 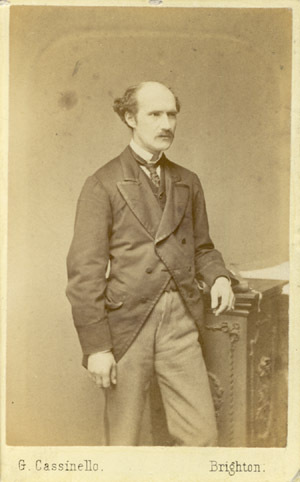 In the early 1850s, George Cassinello worked as a daguerreotypist in the Glasgow studio of Cornelius Jabez Hughes (1819-1884), Mayall's former secretary and chief assistant. 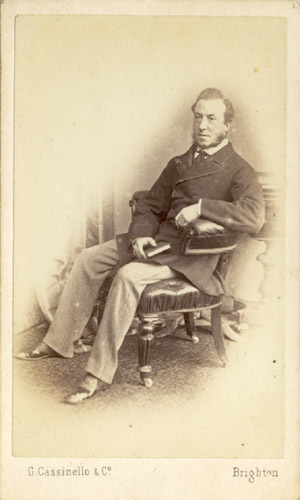 George Cassinello returned to London in 1855 when Cornelius Jabez Hughes took over Mayall's studio in the Strand. After 1855, Cassinello abandoned the daguerreotype process and began to use the "wet collodion" method of photography recently introduced by Frederick Scott Archer. On 13th February 1859, George Cassinello married Mary Ann Anderson (born c1835, Lambeth *) at St. John the Baptist's Church in Shoreditch, London. The birth and death of a baby named George William Cassinello during the 1st Quarter of 1860 suggests that George and Mary Ann Cassinello were living in Islington for a year or so after their marriage. Early in 1861, whilst living in the Holborn district of London, George Cassinello's wife gave birth to a baby daughter, who was named Mary Ann Cassinello after her mother. * There is some confusion about Mary Ann Anderson's year of birth. The baptism of a Mary Ann Anderson, the daughter of William and Ann Anderson is recorded in Lambeth on 26th May 1833, yet in the subsequent census returns, the approximate year of birth is given as 1836, 1838 and 1841. When the 1861 census was taken on 7th April 1861, George Cassinello, his wife Mary Ann and their two month old baby daughter were recorded at 156 Eastern Road, Brighton. George Cassinello is described on the census return as a "Photographic Artist", aged 30. The census enumerator records George Cassinello's birth place as "Geneva" - possibly an incorrect transcription of Genova (i.e. Genoa). The enumerator also noted that George Cassinello was a "Naturalized" British Subject. 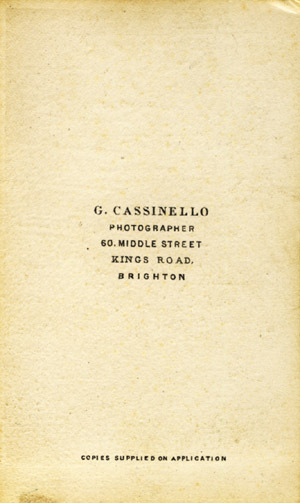 George Cassinello is listed as a photographic artist with a studio at 156 Eastern Road, Brighton, in Robert Folthorp's General Directory for Brighton & Hove, published in 1862. By 1865, George Cassinello had taken over a photographic studio at 70 Kings Road, Brighton, previously owned by the Dickinson Brothers (William Robert Dickinson, Lowes Cato Dickinson, Gilbert Bell Dickinson and Walter Chapell Dickinson). 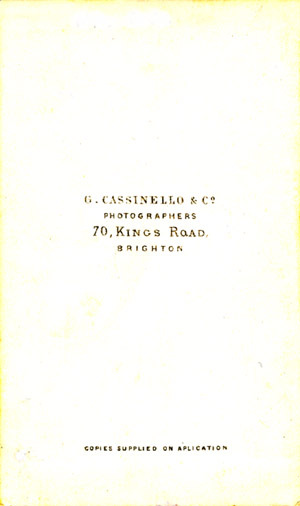 The firm of George Cassinello & Co., Portrait and Landscape Photographers, was listed at 70 Kings Road, Brighton in Page's General Directory for Brighton & Hove, issued in 1865. After a year at the studio in Brighton's Kings Road, George Cassinello moved to a new studio at 60 Middle Street, Brighton, where he remained until 1874. In 1863, George Cassinello's wife gave birth to a son. The baby boy was named George Cassinello after his father. [The birth of George Cassinello junior was recorded in Brighton during the 2nd Quarter of 1863]. A second son, Domenico Cassinello, named after the photographer's father, was born during the 3rd Quarter of 1864. Sadly, George Cassinello junior died in 1865 at the age of two. The 1871 census records George Cassinello and his family at 60 Middle Street, Brighton, where his photographic studio was located. George Cassinello is entered on the census return as a forty year old photographer from "Genova, Italy". Mrs Mary Ann Cassinello, George's wife, gives her age as 33 and her place of birth as Lambeth, London. George Cassinello's two surviving children - ten year old Mary Ann Cassinello and five year old Domenico Cassinello - are also recorded at their home in Middle Street. The last member of the household was Robert Scarpenti (born c1857, Greenwich, Kent), described as George Cassinello's nephew. Robert Scarpenti was probably the son of George's sister Sarah Ann Cassinello who married Antonio Scarpenti in London in 1847. Robert Scarpenti is entered on the census return as a "Photographer's Assistant", aged 14. [ABOVE] The trade plate of George Cassinello, Miniature Painter & Portrait and Landscape Photographer, 44 Ship Street, Brighton, taken from the reverse of a carte-de-visite (c1875). [ABOVE] A carte-de-visite portrait from the studio of George Cassinello & Co., Photographers of 70 King's Road, Brighton (c1865). The carte is inscribed "Mr Bigg" and is possibly a portrait of Joshua Bigg (c1815-1878). [ABOVE] A carte-de-visite portrait of a bearded man, by George Cassinello, Photographer of 60 Middle Street, Brighton (c1868). 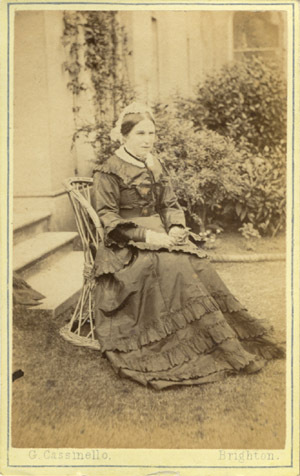 [ABOVE] A carte-de-visite portrait of a lady seated in a garden photographed by George Cassinello, Miniature Painter & Portrait and Landscape Photographer of 60 Middle Street, Brighton (c1870). 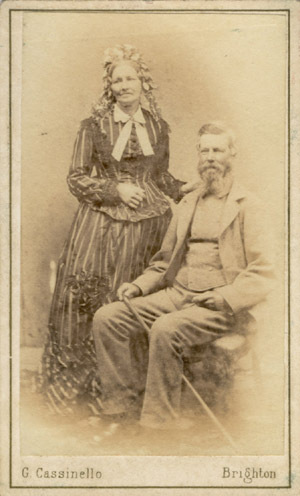 [ABOVE] A carte-de-visite portrait of a couple photographed by George Cassinello, Miniature Painter & Portrait and Landscape Photographer of 60 Middle Street, Brighton (c1870). 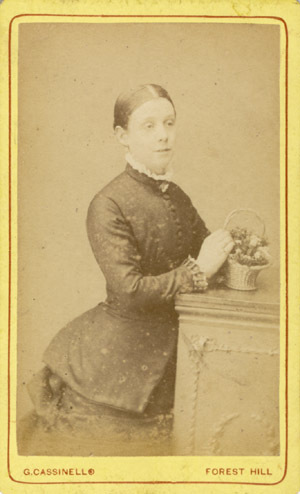 [ABOVE] A carte-de-visite portrait of a young woman from the studio of George Cassinello & Co., Photographers of 70 King's Road, Brighton (c1865). [ABOVE] The reverse of a carte-de-visite from the studio of George Cassinello of 60 Middle Street, Brighton (c1868). 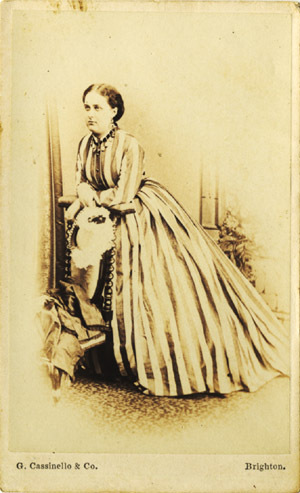 [ABOVE] A vignette portrait of a young woman, a carte-de-visite photograph by George Cassinello, Miniature Painter & Portrait and Landscape Photographer of 60 Middle Street, Brighton (c1870). [ABOVE] A carte-de-visite portrait from the studio of George Cassinello & Co., Photographers of 70 King's Road, Brighton (c1867). The carte is inscribed "Mr Bigg" and is possibly a portrait of Joshua Bigg (c1815-1878). [ABOVE] The reverse of a carte-de-visite from the studio of George Cassinello & Co. of 70 King's Road, Brighton (c1865). [ABOVE] A carte-de-visite portrait of a bald-headed man by George Cassinello, Miniature Painter & Portrait and Landscape Photographer of 60 Middle Street, Brighton (c1872). 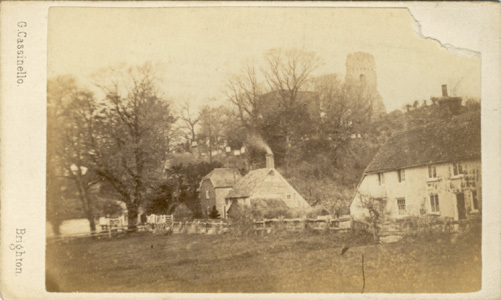 [ABOVE] A photographic view of cottages in the village of Bramber with the ruins of Bramber Castle above. A carte-de-visite by George Cassinello, Photographer, 60 Middle Street, Brighton (c1870). 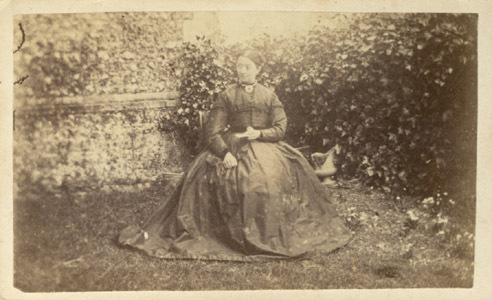 George Cassinello was primarily a studio portrait photographer but around 1870, he visited several villages in West Sussex, including Bramber and Steyning, taking photographic views which he later issued in the popular carte-de-visite format. In the 1870s, George Cassinello advertised himself as a "Portrait and Landscape Photographer" and he produced a number of topographical views during this period. Some of George Cassinello's publicity refers to him being a "Miniature Painter" as well as a photographer, yet this might relate to the common practise of colouring the small carte-de-visite portraits. However, George Cassinello did describe himself as an "Artist" on the 1851 census return. George's daughter Mary Ann Cassinello, later worked as an "Artist - Portrait Painter", which suggests George Cassinello did occasionally work as a miniature artist and probably instructed his daughter in the art of portrait painting. [ABOVE] A hand tinted portrait of a young woman by George Cassinello, Miniature Painter & Portrait and Landscape Photographer of 60 Middle Street, Brighton (c1873). [ABOVE] A portrait of a woman seated at a desk by George Cassinello, Miniature Painter & Portrait and Landscape Photographer of 44 Ship Street, Brighton (c1875). [ABOVE] George Cassinello and Map of Brighton. A Victorian map of Brighton showing the location of George Cassinello's studios at 70 King's Road, 60 Middle Street and 44 Ship Street. George Cassinellio's first home and studio was at 156 Eastern Road, Brighton. Eastern Road leads into Kemp Town, which is marked on the extreme right of the above map. [ABOVE] Extract from the 1861 census of Brighton showing details of the photographer George Cassinello and his family. [ABOVE] Extract from the 1871 census of Brighton showing details of the photographer George Cassinello and his family. George Cassinello operated the studio at 60 Middle Street, Brighton until around 1874. The following year, George Cassinello moved his photographic business to 44 Ship Street, Brighton. 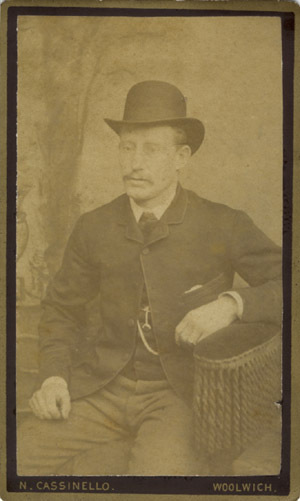 In 1880, after working nearly twenty years at various studio locations in Brighton, George Cassinello sold his Ship Street studio to Gustav Otto Schulz (born c1849, Gornitz, Prussia) and moved to Lewisham in Kent, where he established a photographic portrait studio at 49 Dartmouth Road, Forest Hill, Lewisham. [ABOVE] Extract from the 1881 census of Lewisham showing details of the photographer George Cassinello and his family. Nicola Cassinello was born around 1833, the son of Mary Ann and Domenico Cassinello, an Italian from Genoa. It appears that Domenico Cassinello (born c1793, Genoa, Italy) had married his wife Mary Ann (born c1795, Dublin) in Ireland, but after the birth of their son George Cassinello around 1830, the Cassinellos either moved on to Hull, Yorkshire or returned to Italy. The 1851 census, which records Domenico Cassinello and his family in Holborn, London, indicates that Nicola Cassinello was born in Italy, but later census returns gives Nicola's birthplace as Hull, Yorkshire. At the time of the 1851 census, eighteen year old Nicola Cassinello was working as a "Picture Frame Maker". By this date, Nicola's older brother, George Cassinello (1831-1911) was employed as an "Artist" in a London photographic studio and was serving his apprenticeship as a photographer. It is possible that George Cassinello introduced his brother to photography and instructed him in the use of a camera. There is a suggestion that Nicola Cassinello married in the mid 1850s and it appears that his bride was an Irishwoman named Mary, some ten years his senior. By 1860, Nicola Cassinello was the father of two sons - Dominick Cassinello (born c1857, London) and James Cassinello (born 1858, Woolwich, Kent). In the early 1860s, Nicola Cassinello was working as a professional photographer. In 1862, Nicola Cassinello was recorded as a photographer in Ireland with a business address of 62 Patrick Street, Cork. A few years later Nicola joined his brother George Cassinello in Brighton and began to work as a self-employed photographer from an address near Brighton's Grand Parade. By 1865, Nicola Cassinello was working as a photographer in Brighton. Around this date, carte-de-visite photographs were being produced with the words "PHOTOGRAPHED BY N. CASSINELLO, No. 9 Edward Street, GRAND PARADE, BRIGHTON" printed on the reverse of the carte. 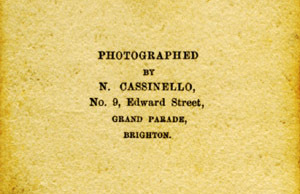 It appears that Nicola Cassinello was active as a photographer in Brighton for a very brief period. Nicola Cassinello's name does not make appearance in the lists of photographers published in the local trade directories between 1862 and 1870 and because he generally numbered his photographs we can tell his output was measured in hundreds rather than thousands. The address of No. 9 Edward Street, Brighton appears on the reverse of Nicola Cassinello's photographs, but he does not appear to have had a photographic portrait studio in this building. The few portraits produced in Brighton by Nicola Cassinello were taken out of doors, on location. During the mid 1860s, 9 Edward Street, Brighton, was used as a tobacconist's shop and it is likely that Nicola Cassinello was renting a room above the shop. Although Nicola Cassinello gave No. 9 Edward Street, Grand Parade, Brighton as his business address, he does not appear to have operated a photographic studio in the building. During his stay in Brighton, Nicola Cassinello worked mainly as an "outdoor photographer", producing views of buildings and taking an occasional portrait in the customer's garden or in front of the subject's house. When the 1871 census was taken, Nicola Cassinello was living with his sons in the Sussex seaside resort of Hastings. The 1871 census records Nicola Cassinello residing in a cottage in Castle Road, at the "rear of Wellington Square". Living with Nicola Cassinello in the cottage at the time of the 1871 census were the photographer's two sons, Dominick, aged 14, and thirteen year old James. Both teenage sons were working as photographers. Nicola Cassinello is described on the census return as a thirty-eight year old photographer and his place of birth is given as "Hull, Yorkshire". The enumerator has entered Nicola Cassinello as a married man on the census return, but no wife is listed in the household. However, a married woman named Mary Hook, a thirty-eight year old "Laundress" from Sedlescombe, Sussex, was residing at Nicola Cassinello's cottage on the night of the census. (Mary Hook is described as a "visitor" on the 1871 census return, but ten years later, on the 1881 census return, Mary is again shown sharing Nicola Cassinello's home. This time, Mary Hook is described as Nicola Cassinello's "Housekeeper", but while she is listed as a married woman, Nicola Cassinello is entered on the return as an unmarried man). Residing in the same road as Nicola Cassinello and his sons was Nicola's seventy-six year old widowed mother. Mrs Mary Cassinello, described on the census return as a Dublin-born "Laundress", is shown living in rooms over a stable in Castle Road, Hastings, with her son Pope Cassinello, described as a twenty-two year old photographer. "Pope" was an unusual personal or Christian name, but there are examples of it being used as a first name in the mid 19th century (e.g. Pope Love, a model boatmaker from the Isle of Wight). Pope Cassinello, gives his place of birth as "London". Sharing the rooms above the stable in Castle Road was Mrs Cassinello's 10 year old grandson, Andrew Scarpenti (born 1861, Marseilles, France). Andrew Scarpenti appears to have been the son of Nicola's sister Sarah Ann Cassinello, who had married Antonio Scarpenti in London in 1847. As with his sojourn in Brighton, Nicola Cassinello's stay in Hastings was brief. By 1872, Nicola Cassinello had settled in Canning Town in East London where he worked as a photographer and confectioner. Nicola remained in Canning Town for the next six years or so. From 1872 to 1874, Nicola Cassinello gave his business address as 73 North Woolwich Road, Canning Town. Between 1875 and 1879 Nicola Cassinello is listed as a photographer and confectioner at 73 Victoria Dock Road, Canning Town. By 1881, Nicola Cassinello was living in the Essex village of East Ham an eastern suburb of London. Around 1882, Nicola Cassinello moved from East London to the military town of Woolwich on the south bank of the River Thames. 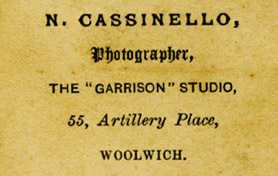 Soon after his arrival in the town, Nicola Cassinello established a photographic studio at 55 Artillery Place, Woolwich. [ABOVE] A carte-de-visite portrait of a man seated on a bench, by Nicola Cassinello of No. 9 Edward Street, Brighton (c1865). [ABOVE] The reverse of a carte-de-visite produced by Nicola Cassinello of No. 9 Edward Street, near Grand Parade, Brighton (c1865). [ABOVE] A photographic view of a house in the countryside by Nicola Cassinello of No. 9 Edward Street, Brighton. 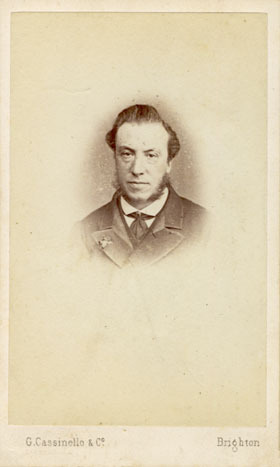 Carte-de-visite No. 374 (c1865). [ABOVE] A carte-de-visite portrait of a woman seated in a garden, photographed by Nicola Cassinello of No. 9 Edward Street, Brighton. 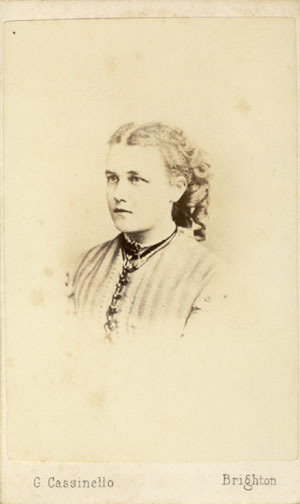 Carte-de-visite No. 372 (c1865). [ABOVE] A photographic view of a house in the countryside by Nicola Cassinello of No. 9 Edward Street, Brighton. 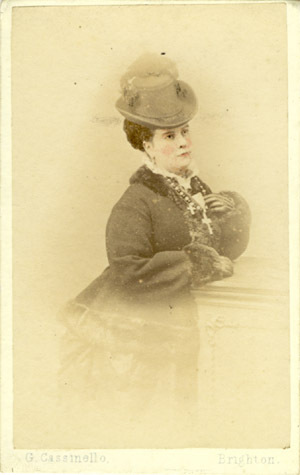 Carte-de-visite No. 375. 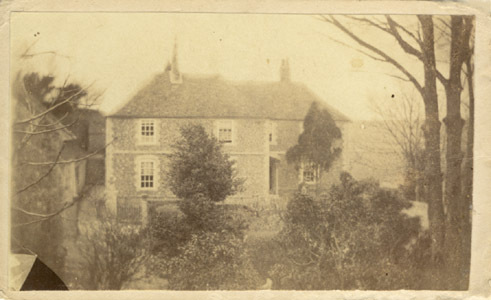 The house in this picture appears to be the same house as featured in carte-de-visite No. 374. 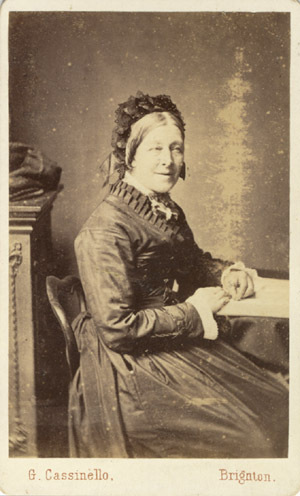 (c1865). [ABOVE] The trade plate of Nicola Cassinello of No. 9 Edward Street, near Grand Parade, Brighton, as shown on the reverse of a carte-de-visite (c1865). [ABOVE] A photograph of a cottage in the village of Kingston, near Lewes, Sussex by Nicola Cassinello of No. 9 Edward Street, Brighton (c1865). Nicola Cassinello (c1833-1890) mainly worked as an "outdoor photographer" during his short stay in Brighton. There is no evidence that he operated a conventional photographic portrait studio at his business address of 9 Edward Street, Brighton ; the few portraits that Nicola Cassinello produced during his temporary stay in Brighton were photographed out-of-doors. Nicola Cassinello's main business comprised of taking photographs of buildings in Brighton and the surrounding area. 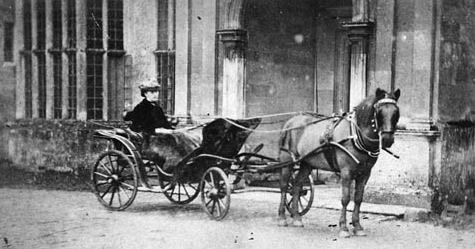 He was evidently prepared to travel five miles or more from his home in Brighton's Edward Street to take photographs of buildings in nearby villages. 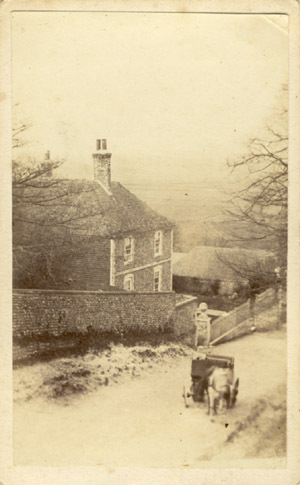 (See, for example, the carte-de-visite view of a cottage [left] photographed in the village of Kingston, near Lewes. [ABOVE] Extract from the 1871 census of Hastings showing details of Mrs Mary Cassinello, the mother of photographers George Cassinello, Nicola Cassinello and Pope Cassinello. Mrs Mary Cassinello died in Woolwich in 1891, aged 97. [ABOVE] Extract from the 1871 census of Hastings showing details of the photographer Nicola Cassinello and his two sons, Dominick Cassinello and James Cassinello. The female visitor, Mary Hook, is shown living with Nicola Cassinello in East London at the time of the 1881 census. [ABOVE] Extract from the 1881 census for East Ham showing details of the photographer Nicola Cassinello and his housekeeper Mary Hook. Interestingly, Nicola Cassinello is listed as "unmarried" on the 1881 census return. At the time of the 1881 census, Nicola Cassinello was living at East Ham, Essex, about six miles east of London, but shortly after the census was taken Nicola moved to Woolwich in south-east London, where he lived for the remainder of his life. ( Nicola Cassinello had previously lived in Woolwich - his son James Cassinello having been born in the town of Woolwich in 1858). 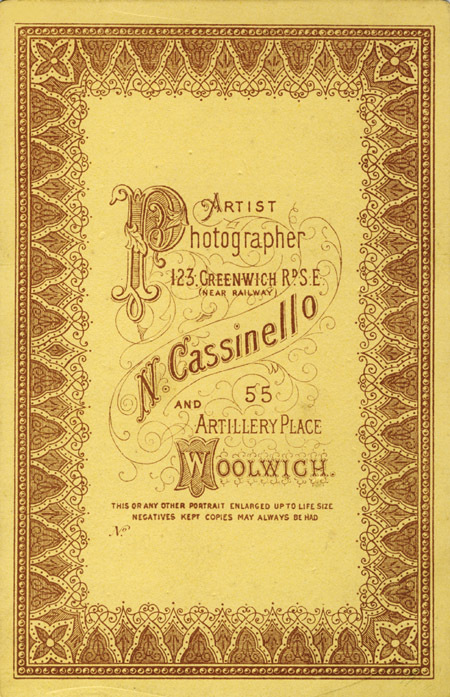 Around 1882, Nicola Cassinello established a photographic studio at 55 Artillery Place, Woolwich. A year or two later, Nicola Cassinello opened a second studio at 123 Greenwich Road, Woolwich, near the town's railway station. This second studio was probably managed by one of Nicola's two sons - Dominick Cassinello (born c1857, London) or James Cassinello (born 1858, Woolwich, Kent). The studio in Greenwich Road was in operation for only a couple of years and by 1885 it was closed. 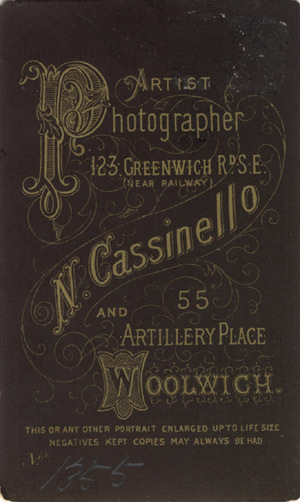 A trade directory still lists Nicola Cassinello as a photographer at 55 Artillery Place, Woolwich in 1887. Nicola Cassinello died in Woolwich during the First Quarter of 1890 at the age of 56. Around 1880, George Cassinello moved to the Forest Hill district of South East London. The 1881 census records George Cassinello and his family at 49 Dartmouth Road, Lewisham. In the census return, George Cassinello is described as a fifty year old photographer. According to the 1881 census return, George Cassinello's two children, eighteen year old daughter Mary Cassinello and his son Dominico Cassinello, aged 16, were both assisting their father in his Dartmouth Road studio. 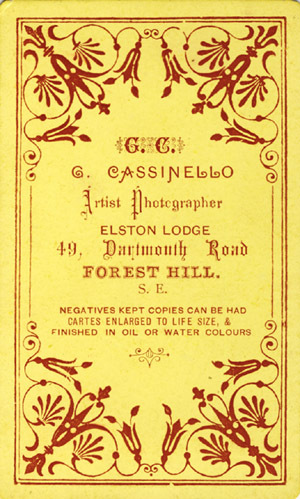 The business details printed on the reverse of George Cassinello's cartes gives the full studio address as Elston Lodge, 49 Dartmouth Road, Forest Hill, S.E. London. When the 1891 census was taken, George Cassinello and his wife Mrs Mary Cassinello were residing in the living quarters attached to George's photographic studio at 49 Dartmouth Road, Lewisham. George and Mary's daughter, Mary Cassinello (born 1861, London) was earning a living as a portrait painter in Brighton. The 1891 census records Mary Cassinello at 13 Dorset Gardens, Brighton and she is entered on the census return as an "Artist -Portrait Painter", aged 30. George Cassinello operated his studio at 49 Dartmouth Road, Lewisham for about twenty years. Around 1900, George Cassinello sold his business premises in Dartmouth Road and moved to 93 Perry Vale Road, Forest Hill, Lewisham, where he continued as a photographer for the next ten years, while his wife Mary Ann Cassinello earned a living as a "Teacher of Music" under the name of Mrs 'Marion' Cassinello. George Cassinello resided at 93 Perry Vale Road, Lewisham until his death in 1911 when he was 80 years of age. [The death of George Cassinello was registered in the district of Lewisham during the 3rd Quarter of 1911]. In the mid or late 1880s, George and Mary Cassinello's surviving son, Domenico Cassinello (born 1864, Brighton), emigrated to Australia where he pursued a career as a photographer. Domenico Cassinello married in 1889 and settled in Collingwood, a city on the edge of Melbourne, in the Australian state of Victoria. Domenico Cassinello and his wife Margaret produced two children - George Cassinello (born 1890, Collingwood, Victoria, Australia) and Mary Cassinello (born 1892, Collingwood, Victoria, Australia). Domenico Cassinello operated photographic studios in Melbourne from around 1890 until about 1903. Domenico Cassinello worked as a photographer at other locations in the state of Victoria before returning to the city of Melbourne in 1908. [ABOVE] The reverse of a cabinet portrait by Nicola Cassinello giving details of his two photographic studios in Woolwich at 123 Greenwich Road and 55 Artillery Place, Woolwich. [ABOVE] Portrait of a woman with a basket of flowers by George Cassinello of Elston Lodge, 49 Dartmouth Road, Forest Hill (c1880). 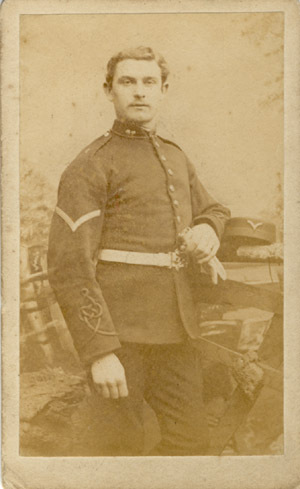 [ABOVE] Portrait of a soldier photographed by Nicola Cassinello of The Garrison Studio, 55 Artillery Place, Woolwich (c1882). [ABOVE] Portrait of a man wearing a bowler hat by Nicola Cassinello of 123 Greenwich Road & 55 Artillery Place, Woolwich (c1884). 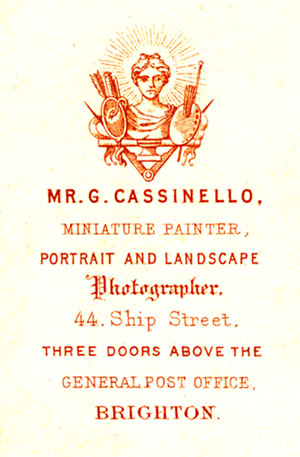 [ABOVE] The reverse of a carte-de-visite portrait by Nicola Cassinello giving details of his studios at 123 Greenwich Road and 55 Artillery Place, Woolwich (c1884). John Cassinello was born in London around 1845. (The birth of a Stephen John Cassinello was recorded in the London district of Holborn during the 4th Quarter of 1845). At the time of the 1881 census, John Cassinello was boarding at 5 Beadnell Road, Lewisham, and he is entered on the census return as a "Photographer", aged 40. During the 4th Quarter of 1881, several months after the 1881 census was taken, John Cassinello married Kate Caroline Crow (born 1864 Sandon, Essex), a seventeen year old servant employed in a draper's shop in Stanstead Road, Lewisham. A photographer named John Cassinello is listed in Kent trade directories with a business address of 9 Church Street, Woolwich between 1889 and 1891. From 1891 to 1892, John Cassinello's studio address is given as 11 Church Street, Woolwich. When the census was carried out on 5th April 1891, John Cassinello, his wife Kate, and their four children - Florence (born 1882), George (born 1884), Charles (born 1889) and Minerva (born 1891) - were residing at the studio in Church Street, Woolwich. John Cassinello appears to have abandoned photography as a profession in the early 1890s. John Cassinello and his family moved to Canning Town where he found work in a local shipyard. When the 1901 census was taken, John Cassinello was recorded as a Ship Fitter's Labourer, aged 53. In addition to the four children already mentioned, the 1901 census return also lists Stephen John Cassinello (born 1896, Canning Town) and James Cassinello (born 1898, Canning Town). Pope Cassinello (born c1849, London) is recorded as a photographer in Hastings in 1871. (John Cassinello does not appear in the 1871 census, so there is a possibility that he is the same man as Pope Cassinello). On the 1871 census, the twenty-two year old photographer is shown living with his widowed mother Mrs Mary Ann Cassinello. 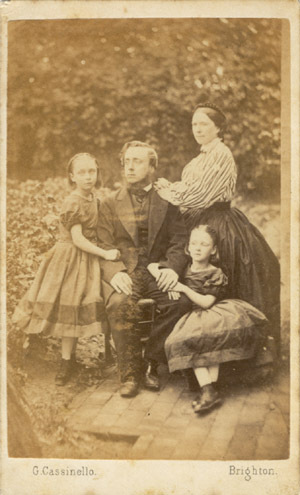 Another of Mary Ann's sons, Nicola Cassinello was also working as a photographer in Hastings with his two sons Dominick Cassinello (born c1857, London) and James Cassinello (born 1858, Woolwich, Kent). Domenick Cassinello and James Cassinello probably assisted their father in his Woolwich studios. 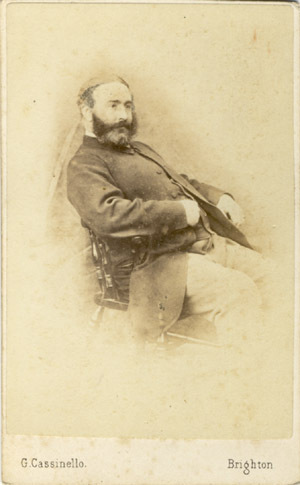 Nicola Cassinello died in Woolwich in 1890. At the time of the 1891 census, Domenick Cassinello and James Cassinello are shown living in Chiselhurst, Kent, with their widowed mother Mrs Mary Cassinello (born 1823, Ireland). Unusual surnames that originated from Italy, Switzerland and France were often wrongly transcribed by English clerks and census enumerators. The surname Cassinello was recorded variously as Cassenelo, Cassanelly, Cassenello, Casonelli, Cassanelli, Cassinelli, Cassinelle, Casinello, Cassmello and Cassinella. 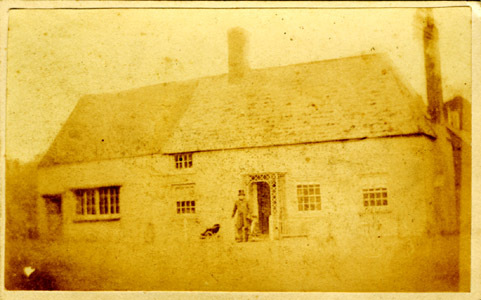 A photographer named Thomas Casenella (born c1853 London) is recorded lodging with another itinerant photographer at William Gander's "Beer House" in Chapel Row, Herstmonceux at the time of the 1881 census. 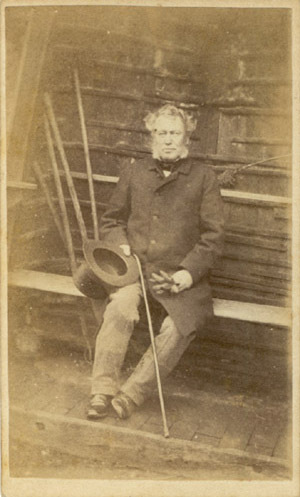 Thomas Casenella's companion was William Hill (born c1852 Buckingham), who is described as a twenty-nine year old photographer. William Hill is recorded as a married man, but Thomas Casenella was single. Casenella might have been the correct spelling of Thomas's surname, but, interestingly, the Australian photo-historian Marcel Safier has discovered a Thomas Cassinello sharing the same address in Melbourne, Australia as the Australian photographer Dominico Cassinello (George Cassinello's son). A Dominico Cassinello c1793- 1860s? Thanks to Marcel Safier of Queensland, Australia and David Webb, the London photohistorian, for providing additional information relating to the Cassinello family of photographers. I am grateful to Robert Hanson of Birmingham for sharing the information he has gathered during his research into the Cassinello Family.